And I like it way too much. I'd probably really skinny if I'd skip the baking hobby. And today, restday, we (Dennis and I) made Tompoes. Dennis told me he'd once a week go to the HEMA with his pocket money (the money he got from his mum to buy school-milk every day) to buy a Tompoes. Tompoes means Tom-cat it is, literary translated. 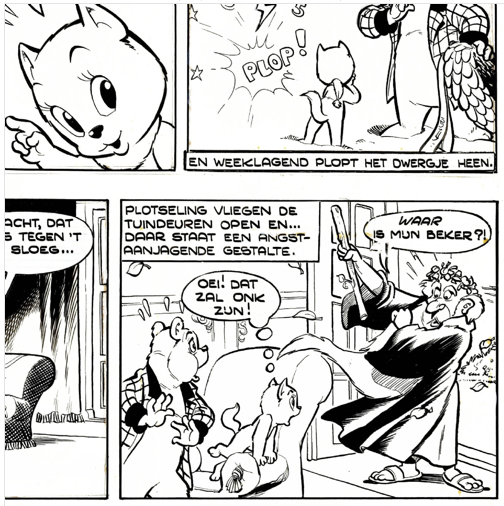 A known comic character, Tom Puss (Tom Poes in Dutch) is even named after the pastry. The pastry looks a little like the French mille-feulle but is far tastier to my opinion. They say the Tompoes has been made first by a bakery/patisserie in Amsterdam. The baker was inspired by the figure of General Tom Thumb. A little man (Charles Sherwoon Stratton) was one of the big attractions from the American circus of Phineas Taylor Barnum. In 1844 and 1845 the circus traveled through the Netherlands. A couple years later a Frysian little man traveled around as well, inspired by Charles. 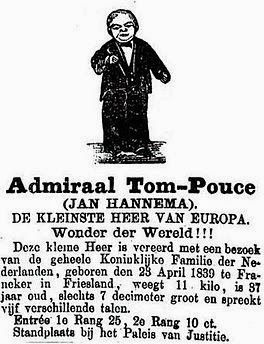 The little man called himself 'Admiraal Tom Pouce' > General Tom Thumb. Both Tom Thumb and Tom Pouce refer to the same fairytale figure. The French version mille-feulle is also called a 'Napoleon' after the rather small postured French emperror. Both Tompoes and mille-feulle probably have the same history but as far as I know it's not really known which pastery was first. The whole process takes at about 70 minutes. Slowly heat up the milk just before boiling point. Add the vanilla to the milk. Stir the other ingredients for the pudding in a kitchen-aid. I just did it by hand, but a kitchen-aid is faster. Start with mixing the egg-yokes. Add the sugar and make a fluffy dough out of it. Now add the Maizena and flour. Add a little of the warm vanilla-milk to the mixture and blend well. Pour the mixture to the rest of the warm milk and stir continuously. Heat the mixture slowly but don't let it boil. When the first air bubbles pop up the mixture should be firm enough. Put the mixture in a plastic bag and totally close the bag air tight (this will be your pastry-bag later on). Closing the bag avoids the mixture getting a 'skin' (sheet). Put the bag in the fridge to let it cool. Roll out the puff-pastry and cut the dough in two. Bake the dough on a plate on 170C (use baking paper). To avoid the dough to raise and bubble up put a scale on top of the dough. The baking takes at about 30 minutes depending on your oven. After baking you can cut the pastry in small blocks, rectangles or whatever you like. Stir the sugar and milk to a thick shiny mixture. Cut a 1cm corner off one of the corners of the plastic-bag. Now you can squeeze the pudding onto the bottom layer of the pastry-squares (or whatever shape you made them). Squeeze at about 2-3cm thick layers onto the pastry. Put the other dough layer on top of the pudding and spread out the icing on top. But most of the times the icing is made pink. You can use berry juice instead of milk (like strawberry) to make the icing pink. The pastry is often served during tea/coffee times after midday.